Imperial Knights: laconically about the most important things. New toys: Dominus class Knights: Castellan and Valiant. 510/500 points respectively. The main guns and two twin meltas are included, and missiles / cannons do cost points. Total, about 600 points. T8, 28 Wound, 3+, 5 ++ from shooting. Tons of shooting anyway. Cannons are worth changing for missiles only if there are not enough points. You can’t fire more than one missile per turn anyway, and cannons bring more firepower. Although, on the other hand, there is a useful stratagem for missiles that allows you to target characters. If you have a lot of CP - you can try. The main defense between two Knights lies in the arms weapons. Castellan, in fact, has a plasma cannon with 2D6 shots and the possibility of overheating, and the Volcano Lance, firing D6 times with a terrible 14 strength, AP-5, and 2D3 damage. Obviously, the first one is supposed to destroy infantry, and the second one is for large vehicles. It would be cool if all the weapons didn’t have a random number of shots again. Valliant is armed with a huge harpoon that wounds any unit on 2+, ignores absolutely any armor (S 16, AP-6 - this is not a joke! ), and deal 10 damage with additional D3 mortal wounds. It also has a reroll to hit against vehicles and monsters - very relevant, given that these units are primary targets of this weapon, and one shot can easily miss. Still looks more reliable than random shots. In the second hand of this knight, you will find a kind of flamer with 3D6 shots, AP -2 and 2 damage. 3D6 gives you a little guarantee that you will have a decent number of shots. One trouble - Harpoon has a range of 12, and the flamer - 18 inches. Therefore, the tactics for each of the new giants are quite obvious. If you are not afraid of a random, take Castellan and leave it in your deployment zone. It is not necessary for him to move, but, for example, there is a stratagem for sharing 5 ++ to the allied units of the Imperium which makes him an excellent company for your screen or gunline. Valiant has to be pushed forward before it gets degraded by enemy fire. In the heart of the enemy army, you may use stratagems to explode yourself and or to spread some mortal wounds around. Considering that knights go out of close combat as easily as before, you can also smash some enemies with your feet. By the way, the codex has a very important stratagem, which allows you to attack units on the second floors of buildings, or rather - 6 inches from the base. Small Armigers have received a shooting version, and this is a real gift. For just 174 points you get a mobile fire platform with two autocannons, each with 2D3 shots, S7, AP-1 and whole 3 damage. Random, of course, again spoils everything, but not so much as in case with their expensive colleagues. Also, Warglaive has been reduced in price, and has received the second profile for close combat - less strength, but more attacks. In general, this is exactly the thing they needed. Questoris Knights, that are already familiar to us, also got some new stuff - Knight Preceptor. In fact, it is a standard knight with a gauntlet, but in his right hand, he carries a las repulsor. Quite an interesting weapon, with two profiles - against the infantry at 36 inches, and against the vehicles at 18. And again, a random number of shots. Maybe be useful for you, since it also gives re-roll of 1=s to the nearest Armigers. It is not inferior to all other versions with one gun in the effectiveness of the weapon, so it is quite suitable for medium range warfare. All the rest, already familiar to us knights are essentially reduced in price. Now it is possible to play the Knights on a standard format, having an army of more than three models. By the way, it is possible to give warlord-traits to several models due to the stratagem. This makes sense because you are most likely to use these two traits: 4 ++ and a free re-roll with bonus CP. The rest are not good enough to make you spend additional 2CP on them. The most useful artifacts are probably 5 ++ in close combat, and +1 to hit for the nearest Armigers against the specified goal (perfectly combined with the Preceptor). The rest are basically enhanced versions of various weapons. There are nine houses, but only one is actually needed - Hawkshroud. Doubling the wounds when calculating the degradation table is so critical for knights the 8th edition that all other bonuses do not even make sense. Not because they are bad themselves, but because need this one too badly. As a result, the codex does not look bad. Now you have several options and even a variety of tactics. The main thing – don’t forget to arm yourself with magnets. The problem of survivability, in general, is solved. However, there is still the problem of a random number of shots - if you are pathologically unlucky on cubes, the Knights are definitely not your army. Also, don’t expect them to autowin - it's quite difficult to handle this army, that requires a thoughtful choice of targets. Considering how few models you have, and how much each one costs, the loss of even one can turn into a catastrophe for the whole army. Take care of your knights and think over each move. Then this codex will be able to bring you some fun. 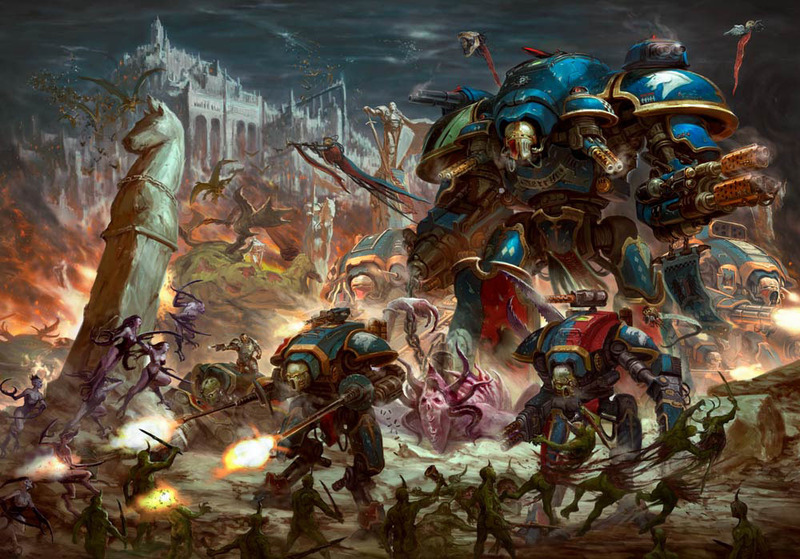 I'm a tyranids player, what would be a good strats against Imperial knights ? I thought about 6 zoanthropes + neuro for smite and other powers, maybe an exocrine or tyrranofex with heavy gun. I would go for the heavy guns, as smite might not do the damage fast enough to cripple one of the bigger knights. Charging depends on the knight you are facing, I suggest you don't charge the Valiant, with its 3d6 7s -2 d2 autohits, your tyrant will be most likely burned to a crisp, and in his turn he can just retreat and do it again if he isn't dead already. Carnifex spam with venom cannons? Other than the Valiant, which is specifically designed as a close quarters support Knight, all other Knights are easily dealt with on the charge if you suitably swamp them. Remember that their invulnerable save is ONLY against shooting. Hit them in close with multiple monsters that do 3+ or d6 damage a hit and they'll go down fairly fast. Tyrannofexs are also decent, but can be focus fired. They can be a distraction to get your melee units in close, or if taken in large enough numbers can do serious damage first and fast. Beyond that, this is the Imperium forum, on a thread about Knights. Not a thread about countering Knights. If you need more focused attention, please make a new post in the Xenos section of the forum. Do not derail this one. I must remind you the Gallant actually got an upgrade with the codex-extra base attack and WS 2+. As for the hate for random? Randomness is next to Godliness. The new Knight Codex seem awesome if you ask me. In my opinion the only thing I'm missing from it is a nod towards Imperial Knight Solaria from the Dawn of War 3 game. Having an Imperial Knight with two Avenger Gatling Cannons (and a Rocket Pod + a Master Crafted Heavy Stubber) would be awesome! But the question is, would it be too overpowered? (Note that Imperial Knight Solaria in this example would then be a Unique Character, and as such could not take Relics). Forge Fire: [At the start of the friendly movement phase, Imperial Knight Solaria may elect to use this ability. If so, it may not move (including advance), Fall Back or declare a charge in the subsequent charge phase. However, Imperial Knight Solaria may use the top bracket in its profile until the start of the next friendly movement phase]. E.I. Stand still = Shoot and Fight using your starting Movement, Weapon Skill and Ballistic Skill values. If you want two Avenger Gatling Cannons, go Renegade. That's where it came from.